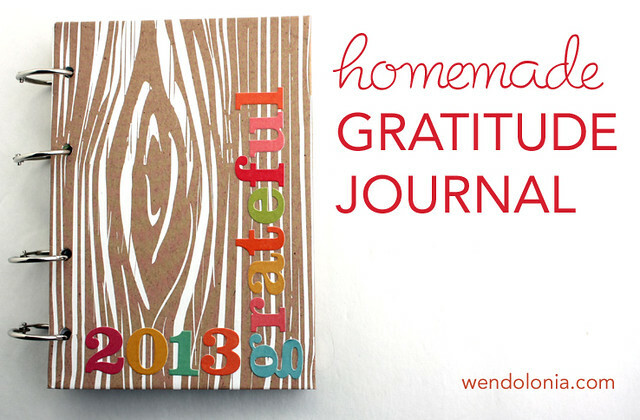 My first big creative project of this year was to create a gratitude journal. I’ve been feeling a bit negative lately and I’ve found that when I’m feeling sorry for myself, it’s helpful to me to try to concentrate on some of the good things in my life — even the little tiny things — so that I can remember that in general things have worked out pretty well for me. My plan is to write down one thing every day that I’m grateful for. Some days I may write a few things down. Other days I might forget. No biggie. I’ve tried keeping gratitude journals before on my phone and in basic little notebooks, but I didn’t find the process particularly fun ao this time I decided to make a cute, fun place to keep my notes. I raided my scrapbook stash and put together a smallish book (5×7 inches) filled with different papers. The design for my book was inspired by this journal by I Love It All on etsy. I liked how she combined full size pages with smaller bits and pieces and envelopes. It’s a look I love — very similar to the homemade smash book I made a couple of summers ago. If you can’t or don’t want to make a book like this yourself, I suggest that you pick up one of I Love It All’s adorable books. Project 365 2012: Week 15 – Spring Break! Wooooo!